I don’t think anybody expected this. With rumors fumbling and bumbling around Los Angeles before the first official day of the Electronic Entertainment Expo, Sony went and made two megaton announcements with the potential to break the internet… twice. After announcing the highly anticipated remake of Final Fantasy VII, Shenmue creator Yu Suzuki came out from behind the curtain after a jaw-dropping teaser to speak about the third entry in the series, which would only be responsible with the help of fan support. 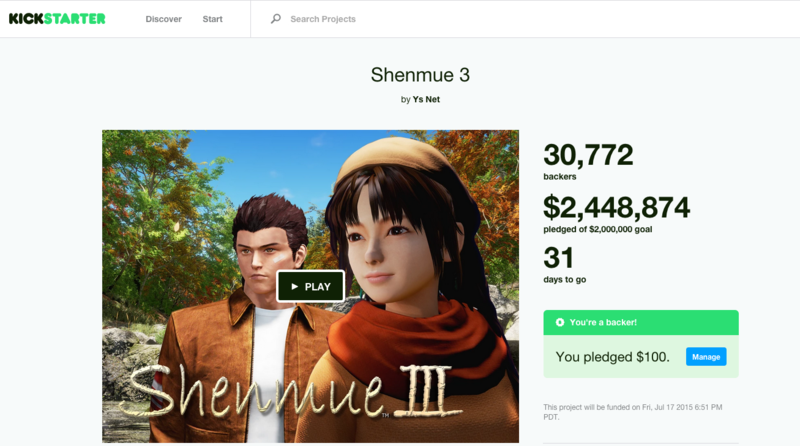 That said, a Kickstarter campaign went live with a goal of $2 million, and the goal was achieved a little more than four hours ago. This came as a huge surprise for gamers as Sega does not have a booth at E3 this year, so it really came out of left field. One of the reasons why demand in the game is so high was because its predecessor on the Dreamcast and Xbox didn’t finish protagonist Ryu Hazuki’s story. This in no doubt is huge for fans and one of our writers, Ted Dedon, who actually wrote a piece about saving Shenmue that’s actually the most viewed article on this site.